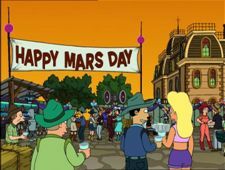 Mars Day celebrates the sale of Mars from the Native Martians to Sir Reginald Wong for a bead. As a part of the celebration, people are allowed to throw garbage wherever they want because, according to Leo Wong, Mars is a "big empty planet." This page was last edited on 13 May 2011, at 16:59.